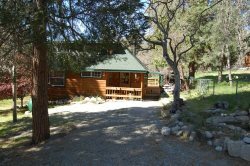 Enjoy this beautiful family friendly cabin, equipped with toys, movies, and games for the the entire family. There s a fun tree house on the property as well as a large yard that is perfect for the little ones to explore nature. This yard is a haven for many birds, squirrels and even deer. For the adults, you can keep an eye on your little explorers from the large deck above while enjoying one of the most beautiful views in Idyllwild. The deck is cozy and perfect for enjoying morning coffee but large enough for a family bar b q. Upstairs has two twin beds and two air mattresses in an A frame "hide out" bedroom. On the main level, is a large, bright master bedroom with wood floors and private bath. A second full bath is located in the hallway that leads to the open floor plan that includes large kitchen, dinning room, and living room. You can enjoy a crackling fire in the large wood fireplace and beautiful views while preparing meals, eating dinner or snuggling on the very comfy couches. The kitchen is fully stocked with all the comforts of home. Also on the main level, there is a huge family room complete with a large comfy couch that makes into a hide a bed, vintage piano, TV, and lots of windows that look out on that incredible view. The cabin has a washer and dryer, and high-speed DSL internet. Easy winter access. Property is located 2.0 miles from the heart of town.